Christians find themselves today in an increasingly secular culture, which is sometimes even hostile to the faith. In this setting, what is the most biblical and effective means of persuasion? 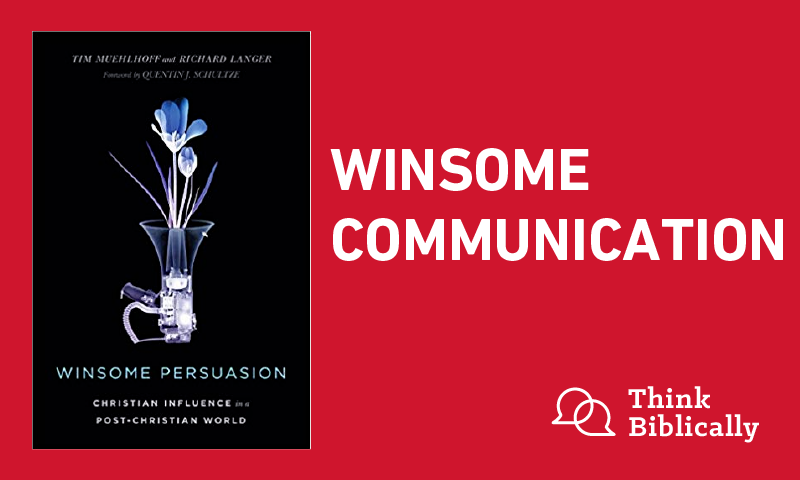 In this episode, Sean McDowell and Scott Rae talk with author of Winsome Persuasion and Biola University professor Tim Muehlhoff about what it means to communicate winsomely today. Tim offers practical ideas for having difficult and controversial conversations. Dr. Tim Muehlhoff is Professor of Communication Studies at Biola. He holds a Ph.D. from the University of North Carolina and is the author of seven books and has contributed chapters to six others. Scott Rae: Welcome to the podcast, “Think Biblically: Conversations on Faith and Culture.” I'm your host, Scott Rae, professor of Christian ethics at Talbot School of Theology at Biola University. Sean McDowell: And I'm your co-host, Sean McDowell, an author, speaker and apologetics professor also here at Biola University. Today, we're here with Tim Muehlhoff, a professor of communications, also at Biola University, and I'm just gonna show my bias, one of my favorite people. Tim Muehlhoff: Aw, I like you, Sean. Sean McDowell: Thanks for being here, Tim. And I'm not even trying to get class credit, so. You have such an important voice today, speaking truth but with winsomeness, I think with clarity, with generosity, and you wrote a book recently. You gave me the privilege of endorsing it. I think it's fantastic, called Winsome Persuasion. Tell us about the heart of why you felt the need to write that and really what it's about. Tim Muehlhoff: I think one of the reasons I wrote it with my co-author, Rick Langer, also at Biola University, is that we're frustrated just like everybody else. There's a study that came out about a year ago that said 69 percent of Americans feel that we are at crisis levels of incivility, that we've lost the ability to talk to each other. And think about it, at a time we need to talk to each other as Americans about transgendered issues, about the nature of marriage, about immigration, about climate control. These are huge issues, and now, we've just lost the ability to do it. People aren't just wrong today, they're evil. And when you have that kind of an attitude, there's not much communication that's happening. We wanna return a sense of winsomeness. Let's have some conversations, and whatever happened to laughing as we talk? Whatever happened to not taking ourselves so deadly serious as we talk about very serious issues? Scott Rae: Now, Tim, I take it you hold that the winsomeness climate culturally has deteriorated in recent years. What do you think accounts for that step backward in the last couple decades? Tim Muehlhoff: I just read an interesting interview with Alan Jacob, who's a Christian intellectual, and I like what he said. He said, "I don't think we're necessarily more incivil today." I mean, there's some great examples of American politics, people challenging each other to duels and even theological disagreements between Luther and certain leaders of the Catholic church, where they just got nasty. Stuff that I could not even repeat on this podcast. That's how bad it was. But here's what Jacob says that I agree with. It's because of the internet that two things have happened. One, we're constantly agitated. When I open up my browser and I go right to CNN, USA Today, I get all of these disagreements and it just agitates me. Second, there is something called disinhibition, which means when I sit down and write that email or send off that tweet, I would never say the things I'm about to say if we were face-to-face at Starbucks. I would tone it down just because we're in Starbucks, and I wouldn't raise my voice. But when I'm sending off that email, or a comment in a comment section of an online article, I just let it rip because I don't know the person I'm necessarily talking to. That disinhibition, I think, has raised our level of hostility and how quickly we start conversations in really harsh ways. There's a guy named John Gotman, a communications scholar, who talks about the harsh start-up. And I think today, because of the internet, man, we have harsh starts-up. When we talk about the president, or different issues, man, we're at high levels of aggressiveness right outta the gates. Scott Rae: It seems like, Tim, we either have harsh start-ups, or no conversation at all. Scott Rae: Because people are so ... they're so afraid of that kind of rhetoric. One of the things I liked about the book was you've got a lot of stuff that's in the middle. Scott Rae: Thankfully, we have more options than those. But let's follow up on the harsh start-ups for just a minute. What are some of the ways in which we can unintentionally, I take it, although maybe sometimes it's intentional, but unintentionally, put people on the defensive during a conversation about something controversial? Tim Muehlhoff: I think we do it by not believing the best about you anymore. I believe actually the worst about you. You don't care about the American flag, and that's why you would support a Colin Kaepernick taking a knee. You don't care about our veterans. Right? There's no nuance in that. I've basically said, "Hey, you support Colin Kaepernick taking a kneel during the anthem? You don't care about democracy. You don't care about our flag, about the soldiers who have given their lives." Man, that's a harsh start-up. And I wanna make the argument from a communications standpoint, people are seldom that black and white. There's a lot of nuance when it comes to very difficult issues. You support transgendered bathrooms, so you don't care anymore about the poor mom who's trying to go to the bathroom with one of ... it's like, whoa, wait a minute. I do care about her; at the same time, I do care about transgendered people within our community. We've lost that kinda nuance, Scott. Right? You're either all for the president, or you're all against the president. You're all for the flag, or you're all against it. Man, that's a hard place to live. Sean McDowell: Tim, I love hearing you say believing the best in other people. One of the things my father taught me consistently, and I'd see him model this in all sorts of ... and say, "Son, assume the best first." And we've lost that. I also wonder if you'd comment on this, how much is the harsh rhetoric due to the fact that we just have broken lives because Rick Warren said, "Hurt people hurt people." And there's a lot of hurt that's going on in our conversation publicly and online. Do you think that contributes to it? Tim Muehlhoff: Sean, I really do. I think God was so wise to say, "You need Sabbath rest." And people who don't have Sabbath rest, when you're living busy lives that seem disconnected from everything, and this disconnectedness adds to relational hurt, unresolved conflict with the people around you, then you head into a difficult conversation ... I have no reserve left anymore. Right? I'm just tired spiritually, I'm tired emotionally, and I'm a little bit frustrated that I listen to these national dialogues, but I don't get to have a voice in it. So when somebody does bring it up, like, “Oh, finally, I get to say what I believe about the flag and people kneeling. I get to talk about this issue and you bear all the brunt of my pent-up aggression because finally, I get to unload on a person.” And that means that's a pretty harsh conversation. Sean McDowell: Do you think political correctness weighs into this? Because I sometimes think that there's a fear to say the wrong thing and you'll be dubbed racist, you'll be hateful, you'll be bigoted. And so people go online and have the sense of anonymity and they just go ballistic, saying all these things they fear to say in other forums. Tim Muehlhoff: One of the best classes, Sean, I took at University of North Carolina, Chapel Hill, was from a guy named Michael Eric Dyson. He's on CNN all the time. And the class was on gangster rap music, believe it or not. The politics. I knew nothing about gangster rap music walking in. Sean McDowell: Well, you strike me as the gangster rap kinda guy. You have that vibe. Tim Muehlhoff: Yeah, I actually look like a Gap representative, right? So, I walk in this class. I don't know anything about 2 Live Crew. I don't anything about race theory. I don't know anything about the deep racial divides. I'm a pretty secluded, comfortable, part of the dominant culture, right? I don't know anything about these issues, but I'm getting introduced to it. So, Dr. Dyson did something the very first day that I loved. He got up, and he said, "Listen, I absolve all of you from saying it perfectly." Tim Muehlhoff: And I thought, what a great way to start the conversation is, "Listen, I know you're not gonna say this perfectly. This is brand new material. We have a lot of diversity in this classroom. But I absolve you. Just say it." And I thought that was really good, and I think we've lost that, Sean. In the land of microaggressions, which I don't want to get rid of, I don't wanna throw the baby out with the bathwater, but I think we're now like, "I'm not even gonna say a word about race or gender or sexuality or homosexuality because I'm sure to offend somebody, so I'm just gonna keep my mouth quiet." I just think we're called to be ambassadors for Christ. We're called to have these really hard conversations. But I get that we've now become tentative because I do not want to be a part of this culture war today. So we just keep our mouths quiet. Live out my faith and never say anything and that way people can't critique me. Scott Rae: Tim, how did we get to the place culturally where disagreement on some of these controversial issues constitutes oppression, hatred, bigotry, and so on? Because I think it didn't used to be that way. And that's what winsome persuasion is, that's where I claim the relational aspect of communication. Sean McDowell: Could there also be a component where we used to be able to separate who we were from what we believed? Now there seems to be a sense where if I disagree with your beliefs, I'm delegitimizing you. Is that a piece of it as you see it? Tim Muehlhoff: Yeah, and that's a part of sexual politics I think that has kinda gone off the rails a little bit, is that I am my sexual identity. And I don't wanna minimize that. I would say my sexual identity's a huge part of who I am as a person. But to say that if you disagree with how I view my sexual identity, now you're attacking me as a person. Man, that's really a hard way to go. I do some corporate training and to say to people you have to divorce yourself from your ideas to a certain level because otherwise we're never gonna have good conversations. Now, when we're talking about that, we're talking about the communication climate between two people. That the climate is strong enough that I can sustain you disagreeing with my ideas even though it's really important, but it's not a critique of who I am. That's a very mature communication style that I think we've kinda lost a little bit today. Tim Muehlhoff: Yeah, from Duke. Sean McDowell: From Duke University. Great conversation, and you said you had been asked a bunch what is authentic communication? And you said it's genuinely not ... correct me if I'm wrong, but it's not having a conclusion as you go into a conversation. Now let me push back on that. You tell me where you think I miss. It seems to me that I can come into a conversation with conclusion about what I believe, but an openness to change if somebody's persuasive and makes a good point. So, I can have a conversation with an atheist about the resurrection, right? I already believe it, but if you really could show me that it wasn't true, I should change my beliefs. So, talk to me about how your definition might push back a little bit. Sean McDowell: I feel like you're attacking me. Scott Rae: I'm gonna have to step in and mediate this here shortly. Tim Muehlhoff: Thank you. Scott's showing me the cover of my book right now, Winsome Persuasion. No, Sean, I absolutely agree with that qualifier. I think that's a great one. Here's what we get. As Christians, I head into a conversation fully convicted in what I believe, and there is nothing — I've already determined this — there is nothing you can ever say that would ever dislodge me from my belief. I don't think that's an authentic conversation. There's a quote we use in the book, "An Episcopalian said of a Baptist, 'I can't listen to you because what I think you're about to say.'" I love that quote. Tim Muehlhoff: So, I agree that I can have strong Christian convictions, but I don't know what your perspective is yet on the existence of God or your definition of marriage or sexuality. If I already head in saying, "Listen, I'm gonna be polite as you talk and I'm gonna nod, but there's not one thing you can say that will make me reconsider any of my beliefs," I don't think that's an authentic conversation. Now, I get hit pretty hard with that because people say, "So, is it possible that you could be wrong about God's existence? Is it possible you could be wrong about Jesus being the only way to get to God?" And let me just say, the answer is yes. I could be wrong. Now, I don't think I am. I've been studying this a long time, but it is possible that there's something you say that causes me to revisit certain beliefs that I have. Otherwise, why have this conversation? Let's just email each other. Because these are competing monologues, not a dialogue. So, I think as Christians, we've been really bad conversationalists because I walk in and everything I defend with full gusto and full conviction. So, heading into this conversation, there's nothing I can learn from you. So, when I apply to UNC Chapel Hill, think about this for a second. I'm on staff with Campus Crusade for Christ. I had to list that as my employer. I transferred grades from a foreign theological seminary, so these people from UNC are reading my application, and I'm sure they're thinking, "Campus Crusade for what? And foreign seminary? Who is this guy?" At the very end, the last question I got from the acceptance committee — this was for my master's — the guy looked at me and he said, "So, just one quick question. Are you here to learn or to convert?" And I said, "Man, that's a great question. I'm here to learn. I really care about communication theory, and I really do wanna learn." He goes, "Great. We're gonna accept you, and we're gonna put you with Julia Wood, the top feminist theorist in the world, and let's see how this goes." So, you know what I mean, Sean? Tim Muehlhoff: I thought that was a great question. And I think that's a great question to say from a non-Christian to a Christian. "Hey, is this all about you just converting me? Or are we actually gonna have a give-and-take conversation where there's a possibility I could say something that would influence you?" Tim Muehlhoff: Oh, Sean, absolutely. Sean McDowell: So, I should sit down and be open to change my mind on racial issues, moral issues, sexual issues? That's threatening and I'm wondering why. And tell me if you agree with this, or you would nuance it. I do this thing at church. I'll show up, put glasses on, become an atheist, take questions and respond. Twenty minutes into it, people get really defensive and upset. Well, I'll come at them and say, "Why'd you get upset?" I'll say, "I think it's because maybe you don't know what you believe and why." And I press those buttons, you get defensive. So, what you're really saying is we have to have convictions, know what we believe and why to have these conversations. Tell me what you think about it. Is that the heart of it? Why these conversations are threatening, that we don't really think through these issues well? So, I think, Sean, we just start to retreat. And we say, "Listen, I'm just gonna stay in my own intellectual bubble, and I'm gonna feel comfortable with this." But I don't think that works. I think those doubts, they surface all the time when you hear an articulate person. I teach in my communication classes, and Winsome Persuasion's all about this, is Aristotle's method of the dialectic, which is can you present both sides of an issue? Can you sit down and say, "Okay, this is what a person would say who disagrees with me and here's my position"? Most Christians, Sean, I think cannot do the method of the dialectic, nor do they see any benefit of doing the method of the dialectic. So, here's an apologetic illustration that I don't like, but I hear it all the time. How are bankers trained to notice a counterfeit? You know the answer to this, Sean, right? Is what? Sean McDowell: By looking at the original. Tim Muehlhoff: That's it. That's all I need to do. Tim Muehlhoff: I love it. No, but you know what I mean? So, all I need to do is study the original. All I need to do is study my faith. I don't ever look at anything else. And by the way, there's a theory that we use called inoculation theory that shows that if that's the only thing we have in our toolbox, we're unwittingly making our students more susceptible to counterarguments. So, inoculation theory is very quickly this: if all I do is give you positive affirmations, if all I say is let me give you the 10 reasons why we hold to traditional marriage. Let me give you the 20 reasons the Bible is the inherent Word of God. Let me give you 15 reasons Jesus rose from the dead. But I never explore counter-arguments, I've actually set my students up unwittingly that when they leave and the first time they hear an articulate rationale of why God might not exist, they stop, and two things happen simultaneously. One, they immediately begin to buy the argument because they've never heard an articulate argument. But the second thing research showed is I immediately mistrust my authority figures. Hey, did you not mention this objection because you didn't know about it? And second, what else aren't you telling me about? If you knew this objection was out there, but never brought it to my attention, what else is out there that you're shielding me from? And I think when kids are young, we shield to a certain extent, but my goodness, when they're in high school or college, I think we do a great disservice by shielding them. And that's what Kinnaman said in his book You Lost Me. We're losing the younger generation because they feel overly protected, and I think we need to gradually test their muscles and get them out there and do the method of the dialectic. Scott Rae: Let me push back on another area that came out in the book. As I read through the Gospels, especially the life of Jesus, he had some pretty un-winsome moments in his life. Scott Rae: I mean, he has really harsh things to say to the religious leaders, like whitewashed tombs and sons of the devil. And he cleared out the temple, which was not exactly a bridge-building activity. How does that fit in to your notion of a winsome persuasion? Tim Muehlhoff: Well, Scott, I'd love to answer that, but I think we're outta time, aren't we? Scott Rae: Actually, we've extended this to part two. Tim Muehlhoff: No, that's a great question that comes up and I would even add the Apostle Paul to that mix when he's talking to the Judaizers, right? So, it seems my best answer to this very complex question is it seems that Jesus changes his rhetorical approach, so does Paul, depending on who he's talking to. So, Jesus is amazing when he's talking to people outside religious authority. This is his table fellowship. And in the book, we do a case study of his table fellowship that he sat with people that were just scandalous. Tax gatherers, known sinners, and yet he felt very comfortable to sit with them and have winsome conversations with them. But boy, when he gets to the Pharisees, this is when we get the whitewashed tombs comment. Paul, exact same thing. We know in Athens, on Mars Hill, we know what Paul thinks about idols. It says that it literally turns his stomach. But when he talks, he says, "Men of Athens, I observe that you're men of worship." Fascinating that he makes that rhetorical choice. So, I think both with Paul and Jesus, they separate between a religious authority that they feel like are abusing the flock from people outside of the flock, outside the Christian community. I don't know how we apply that, but I do think Jesus takes very seriously religious leaders and if he feels like you are laying an unfair yoke upon that congregation, or this people group, Jesus is very quick to hit them pretty hard. And I think Paul with the Judaizers is saying, "You are purposely leading them away from the gospel, and I'm now going to confront you in unflattering, non-winsome language." So, our book, my last answer is, our book is written definitely for those outside the Christian community. Rick and I are now exploring the idea of winsome persuasion within the church. Tim Muehlhoff: Yeah, I think that'd be great. Our book, though, clearly this is winsome persuasion with people outside the church, where Jesus and Paul seem to take very different, much more gracious approaches to those. Scott Rae: Yeah, as I think about the life of Christ, I think there's several places where he's really tough on people who I would say are in denial about their own spiritual condition. Which I think the religious leaders would fit that category. But the tax collectors and the prostitutes and the lepers, he was gentle and gracious. But I think probably because that façade of spirituality had already come crashing down, and they were much more free to admit their sense of spiritual poverty. And so we kinda feel like the church is stuck there. So, we rather would go with the persuasive and pastoral. You don't run up to a traffic accident, pop your head into the window of the car and say, "See? You should've been wearing your seatbelts." We feel like the pastoral is, "Listen, I know we disagree on these issues, but your community's hurting right now. And we recognize the hurt, even the hurt that our rhetoric is causing your community, and we want to minister to you as much as possible." So, we're not anti-prophetic, but to be honest, we are pro-let's-get-the-pastoral-in-there and let's-get-the-persuasive, which we think the pastoral will open the door to the persuasive. Scott Rae: We've got time for one more question here. Give me one example of how winsome persuasion has been effective in your own personal experience, conversations with people you've had. Tim Muehlhoff: Yeah, so I had a grad student who ... brilliant man, who totally disagreed with my Christian stances on anything. And it'd be one of those things where you walk in the room and conversation would suddenly stop. And you just realize, man, I think they were talking about me. There's actually a fellow grad student who grabbed me and said, "Man, I don't know what you did to this guy, but he's ripping you up and down every time you're not around." And you know, okay. So, one day, he is trying to make copies because he's gonna be evaluated in his teaching like all grad students and the copier just isn't working. It's malfunctioning and you can see the stress. He's gotta leave to teach a class and then he gets evaluated, but the copier's not working. Honestly, there was a part of me, Scott, a part of me that was looking at this grad student and just wanting to say, "Hey, karma man, karma." Right? But I felt the moving of the Spirit, and I went up to him, I said, "Hey, can I help?" And he just looked at me like, "What are you gonna ... ?" And I said, "Listen, seriously, what do you need?" He goes, "Well, these gotta be collated, they've gotta be ... and then I gotta..." And I said, "Listen, I'll do it." And he goes, "Really?" And you could just tell, hey can I trust you because you could really jam me up right here. So, I did it. Now, listen, I didn't use that copier. I didn't even have enough faith. I went to Kinko's, plopped down a credit card, got it done. But showed up and gave it to him. And I'm not saying that he suddenly agreed with all my conservative positions, but the relational tone changed from that day forward. We now said hi to each other and had more productive conversations because I showed him, as Paul said, when those who hate you are hungry, feed them. Or as Eugene Peterson says, "When those who hate you can't get copies made in a faulty copier machine, go and help them." And I think that's what we're saying. This book could've been called "Winsome Neighbor Love." We do believe the second great commandment opens the door. So, I think that in my own personal life, focusing on the relational helped me more with the persuasive. Sean McDowell: Tim, thanks for coming on. This has really been fantastic. I was a communication major at Biola, but fortunately, before you came. But it really helped me to pay attention, like you said, not only to the content of what we say, but how we say it. And that's really the formula you go into in your book Winsome Persuasion. We have the truth. The gospel's what sets free, but paying attention to the way we communicate that today is vital and one of the most important tasks for individuals and for the church. Tim Muehlhoff: Yeah, well, thank you. Sean McDowell: Thanks for your boldness and willingness to speak out on controversial issues, but to do it winsomely. This has been an episode of the podcast “Think Biblically: Conversations on Faith and Culture.” To learn more about us and today's guest, Tim Muehlhoff, and find more episodes, go to www.biola.edu/thinkbiblically. That's biola.edu/thinkbiblically. If you enjoyed today's conversation, give us a rating on your podcast app and share it with a friend. Thanks for listening and remember, think biblically about everything.